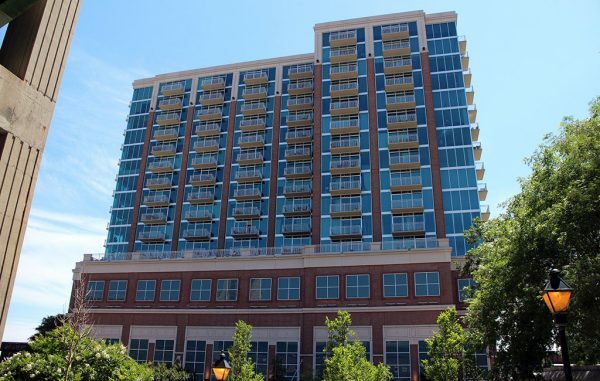 A well-known local businessman and former treasury secretary has unloaded his downtown Richmond condo for a cool million. John Snow, the former CEO of what is now CSX Corp. and treasury secretary under President George W. Bush, last month sold his double unit on the 16th floor of the Vistas on the James for $1.05 million. Snow, now chairman of New York-based investment firm Cerberus Capital Management, was the original purchaser of the 2,500-square-foot unit with his wife Carolyn. Property records show they paid just over $1.05 million for the condo in 2007, the year after the 18-story high-rise was built alongside the downtown canal. The ownership later was transferred to Snow individually and then, in 2012, to an LLC called Snowbird Investments, which was the seller in the May 29 off-market transaction. The buyers are attorneys Rick Burton and Mike Shebelskie, a married couple relocating from Prince George County, where they recently sold Burton’s historic family home. Downsizing, the couple sold off antiques, art and furniture they’d collected in an auction that was highlighted in a recent Times-Dispatch article. The two attorneys – Burton retired and Shebelskie a partner at Hunton Andrews Kurth – had been renting the unit from the LLC for several months before the sale, according to listing agent Sue Farrell of Joyner Fine Properties. Farrell would not discuss her client but said the condo came to the buyers’ attention when it was listed in late 2015. The unit was later taken off-market, and Farrell said Burton and Shebelskie made an offer and arranged to lease the unit prior to closing. Burton and Shebelskie were represented by Jennie Dotts of Long & Foster affiliate Virginia Properties. Dotts said the couple liked the condo for its building-end location with east-facing views of the river and Main Street Station, as well as its proximity to Shebelskie’s office at Riverfront Plaza. Dotts said the condo has four balconies that provide 270-degree views of the city. Farrell said those views are further enhanced by the unit’s 85-foot floor-to-ceiling windows. 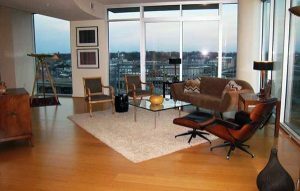 The three-bedroom, three-bath, single-level condo is one floor above another notable Vistas unit: a corner double unit that housed film director Steven Spielberg while he was shooting “Lincoln” in Richmond in 2011. That unit sold in 2013 for $1.2 million.